Drop! Explore! Discover! Return! 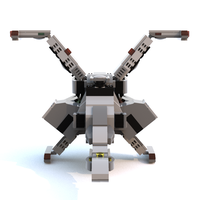 The DEDR Dropship is the primary landing craft of the LEGO Space Exploration Fleet. Once its mothership is in a geostationary orbit to aid emergency recovery, a DEDR Dropship can break orbit and shortly afterwards break new ground on the target planetary body. 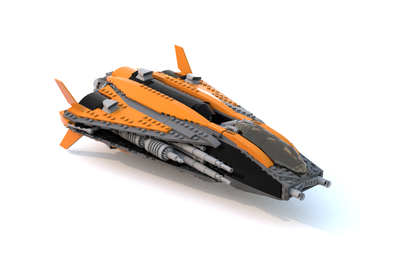 The DEDR Dropship is a modular craft, designed with reusability and safety in mind. Its pilot is often the first to raise a flag on a new world, so although there are risks, there is no shortage of volunteers. Fortunately the DEDR is a tried and trusted design and incidents are rare, as landing sites are carefully assessed before a mission begins. As runways are not generally naturally occurring geographical features (!) the DEDR is rigged for vertical take offs and landings. Like early landing craft, the DEDR relies on its heatshield to penetrate the atmosphere safely and subsequently stabilises and sets down using a combination of thrusters and its main engines. It settles on its heatshield or discards it before landing if necessary. This means that the DEDR’s cargo compartment is at ground level on landing. Its outer hull petals raise to the horizontal and its solar panels deploy from them when of use. This allows the departure ramps to lower for cargo deployment shortly after landing. Although the DEDR is not a large ship, its cargo capacity allows for starter missions on the new world to pave the way for further missions. The main propulsion systems and fuel tanks are mounted above the cargo compartment in order to give them ground clearance and avoid damage on landing. In an emergency the DEDR can theoretically land on its horizontal aspect and still deploy its cargo, but this is certainly not recommended! However, it is possible for it to land in water by deploying its outer hull petals ahead of landing to act as flotation aids. The DEDR is not intended for long duration missions, so life support systems are relatively minimal. Consequently rapid returns can be critical, and the final element of the ship is more than simply a command module. It doubles as an escape pod in extremis, either boosting back up to the mothership in orbit or translating to horizontal flight by deploying its wings to find a safe landing site. The module can then be mated to another lifting body and cargo compartment for the next mission. The command module also serves as the communications link to the mothership, deploying a satellite dish on landing. This is an Idea that has been in my head for a while, and originally I thought it would hold craft for multiple terrain types. It then occurred to me that with a mothership in orbit you could just load the right craft for the mission, provided your dropship could land on the terrain it was going to encounter. Of course most dropships fly horizontally in science fiction, but this Idea is intentionally a little closer to more realistic planetary landing craft like those envisaged by NASA and SpaceX for landing on Mars. 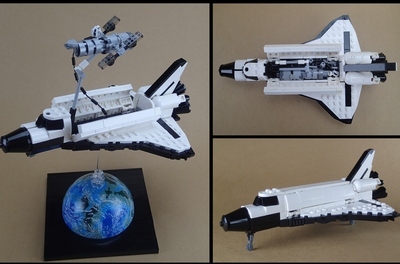 I also liked the idea of the ship holding a minifigure so that they could explore and have adventures in a smaller manned vehicle, whilst also incorporating an escape ship that could be played with in its own right. 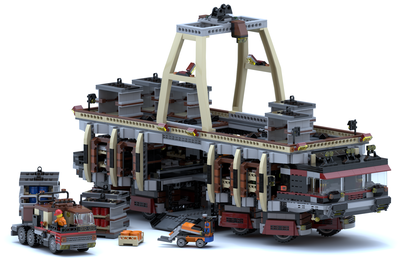 I started off many years ago with what is now classic space, and I loved the set that opened up at the back – the cargo compartment idea here is similar. Use the built in vehicle, or make your own equipment! I hope you enjoyed the backstory and like the model enough to vote for it – please tell your friends if you do and ask them to add their support too! Thanks for reading! I'll add more vehicle options if there's demand. As for that final image, well, I promised my son I'd include it! He might just be right!